This past summer, I spent 3 months rambling round the Irish countryside. By matter of chance and good research, I found a gem of a man, Bernie Winters, who lives on the west side of Clare Island where he farms the way his father, grandfather and 4 previous generations have farmed. Both literature and other farmers have told me that Bernie’s ways are typical, not of just Clare Island, but of the west coast in general and, in particular, any farm close to the ocean. While others on the island weave tidbits of the ways their fathers taught them into their conventional methods, Bernie is definitely the only one on Clare Island, and perhaps on all the west coast, still farming entirely by the traditional methods. He rears 80 sheep, 2 cows (1 for milking), 13 hens, and a dog named Pinch. Clare Island is a small island, roughly 3 miles square, but among the largest of this "365"-island archipelago of Clew Bay, northwest Ireland. By the mid-1700s, the British ruled the Irish parliament as well as their fields. In 1790, over the course of 11 months, the boundary wall that circumnavigates the center area of Clare Island was erected. As seen by the excessive quantity of stones that naturally overpopulate the Irish fields, building walls was an obvious practicality to farm the countryside. And from the number of walls that define today’s picturesque landscape, one can see that building stone walls was a favorite pastime for the British in Ireland. And so the walls stand in memory of an enslaved heritage, but they have also been greatly appreciated and utilized by millions of people since. 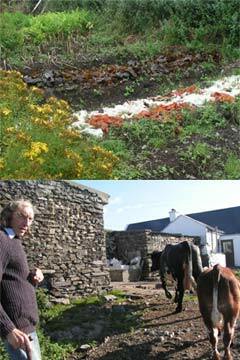 On Clare Island, this wall created a commonage where sheep and cows were allowed to graze. "Units" of the commonage were divvied out to the islanders depending on their wealth and collectively used for the island's sheep, cows and donkeys. For example: 6 sheep = 1 cow = 1 unit = 1 acre on the commonage. Bernie’s family was given 50 units, which he still owns and where he keeps a portion of his sheep. With a wall, a full-time ‘herder’ was no longer necessary, and crop loss to animal grazing became an obsolete worry. The wall was seen as an improvement to the community because previous to that, the animals roamed the island freely, making no distinction between the wild and cultivated fields. However during the famine, the island lost nearly its entire population and has never restored its former 900 inhabitants, but remains at a mere 140, on a good day. And so the commonage has taken on a new meaning ,and grazing one’s sheep and cattle there is seen as vital to keeping the grasslands "mowed" and fertilized. In this century, a few significant changes of home and farm life have occurred that make Bernie’s way of life slightly different from his ancestors’, as well as slightly easier. In 1912, Bernie’s grandfather received a grant from the government to put slate on their cottage’s roof to replace the thatch. Bernie’s family never vaccinated the animals, and they would lose half the flock each year. Now that Bernie vaccinates his animals, he only loses the odd one. This resulted in a huge improvement in the quality of life that the sheep live, the wear that the land bears, and the labor and time that the farmers contribute. In 1983, Bernie’s father installed electricity in the house, which Bernie uses for a light bulb in the cottage and one in the barn, a radio to listen to Irish radio1, and small television to watch Gaelic football. Growing up, Bernie always cooked over an open fire; however, 80% of the heat produced was lost, and so Bernie bought a stove in the mid-1980s to more efficiently burn the turf that he collects. And now, Bernie receives subsidies for each head of sheep and cattle he raises. Bernie Winters is a tall man, perhaps in his late 70s, living in his Irish cottage on the sea. Made of stone, lime plaster, and the hands of his 17th-century ancestors, this cottage has reared 7 generations of Winters. Continuing on the land where his family first began, Bernie stewards that land the way they taught him, and that’s where he showed me the ways. On my first day we went to the secret garden that is not hidden from the neighbors, but rather from the gales. Billowing with force year-round and particularly in the winter, the gales arrive having been unobstructed by any landmass for thousands of miles, pounding their spirits onto the shores of western Ireland, against the stone cottages and across Bernie’s garden. Standing against this assault, thick hedgerows of fuchsia and thicket are grown 9 ft tall to surround the 500-sq-ft rectangular garden containing his "lazy beds," as Bernie calls them. They are about 4 ft wide and 15 ft long, growing onions, carrots, beets, lettuce, potatoes, parsnips, and many herbs including St. John’s wort, fennel, thyme, rosemary, parsley, borage and ginger-mint. It is only during the spring and summer that he plants these beds, for the weather is too wet the rest of the year for the trouble of growing. Furthermore, it is during this time that the beds are put to rest and given time to "replenish." As soon as the winter rains break, Bernie breaks the land for the first of the spring plantings. Onions, garlic and lettuce are sown between the 1st and 13th of March, depending on the weather. The February frosts have always been welcome help since they do the initial backbreaking work of cracking and opening up the compacted winter soil. However, in recent years, frost has been a missing tool all across Ireland. Following the vegetable plantings, the ubiquitous and essential spud is planted under the spring’s new moon or on Good Friday. The main crop is Kerr’s Pink and Cára, while the early crop is the British Queens. In each row, the spuds are sown 18 in apart while the rows are laid 12 in apart. Later in the spring, carrots are sown. Bernie says the best time to sow them is in the middle of May. In the late summer, changing ocean and climatic patterns begin depositing seaweed on the shores. 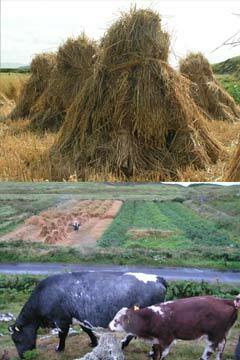 One kind in particular has for centuries been of utmost value to the farmers of western Ireland. For several mornings, we collected the slimy bundles, full of potash, to spread on the beds after harvesting the spring potatoes. All the potatoes are dug out except those which he selects for seed and leaves in the beds until October when they are dug up, stored until December, sprouted in the house and planted in March and April. On those freshly forked beds, a single layer of freshly collected seaweed is laid and left to decay. After a month, we repeat the process. If there is enough seaweed on the shores for a third layer, he will collect it, but otherwise, two is plenty. But that is not it for fertilization. After the seaweed has rotted, the weather, too, has turned rotten, and so the two heifers and Tom, the donkey, are brought into the barn to live for the winter. Their dung is collected and put on the beds where it can rot in the rains until spring planting. This is the centuries-old technique of Irish fertilization. 1. The only remaining station in Ireland that broadcasts solely in Irish, delivering traditional music and the latest news. 2. Unique to Ireland, a cross between soccer and rugby. On the other side of the boithrin3 lie seaside hills with steep cliffs, where Bernie mimics a similar routine. Here, he has two large fields growing oats and potatoes that are alternated each year. Only one layer of seaweed is applied there, and ten loads of manure are added to each ridge. Each ridge is 4-5 ft wide and 200 ft long. To Bernie, one load is comprised of two wooden cleaves attached to the side of Tom, filled with manure. My rough estimate is that three five-gallon buckets fit into a cleave. These cleaves were made by Bernie from driftwood. Last year, he did a little experiment. Since the sheep pastures are not cared for in any intentional manner, their care is simply that the sheep graze, the rain waters, and their manure fertilizes. In a small patch, Bernie laid one layer of seaweed last summer to rot in the weather, just as he does in the beds. We paid a visit to that spot in August, and the lushness, depth of color and diversity of greens it supported were starkly richer than the surrounding pasture. Seaweed's ability to fertilize the land and encourage beneficial growth was clear. It was not only potato-harvesting and seaweed-collecting season, but also oat-cutting season. We sharpened the sickle and set out to the fields. Bernie had already cut half of the field during the first two weeks of August. And so, we had the second half to cut. To use the sickle, with a crescent loop movement, the blade carves the section to be cut, and the alternate hand takes the oats in a bunch to push them in the opposite direction that the blade then cuts through. When a large handful is collected, it's then laid down in bundles forming an orderly pattern of freshly cut oats that begins to tag behind Bernie. The next row is then laid down in a similar way; however, the oat rows are always cut in pairs so that the oats laid always have their grain heads facing, and even resting on, each other. Each of these bundles makes up a sheaf that is then tied together by gathering 4-5 stalks to wrap and twist-tie it secure. The next step is building the conical stooks for drying. Each one contains 20 sheaves, with 16 arranged in a spiral and 4 upside down on top to cap it. 3. Irish for a small lane. No Irish farming teaching is complete unless it is done in the rain. The night before we started up cutting the oats again, it was spilling rain and howling wind. It did not hold back from another bout in the early morning, and so we spent some time watching the rain, cracking jokes and drinking tea, waiting for it to pass and then giving the oats an hour to wick off the heavy water. Then we were off for the day's work; it spit a little, but we didn't mind. We took lunch for a half-hour while it poured rain and then kindly held back. Consequently, we held off for an extra half-hour and then went back to the sickle. We made good progress and got into a rhythm under the thick cloud cover, fresh air and sweet smell of wet grains. We persisted through the spits again; however, this time they got progressively harder. At that point, we each took to a stook and ducked beside its sturdy build, hoping for some “cap” protection as well. Behind me, and to both sides, stooks of oats kept us company, and in front of us, the uncut grains stood up against the weather. After that heavier bout of wet weather, we refrained from cutting more and simply “stooked” the remaining sheaves, wet as they were, into the inherently gorgeous stooks. The field was finished the next day with a few hours work. Margaret Lloyd worked as an apprentice and assistant to the garden manager at Ecology Action for two years and has now taken to the “fields.” At the end of October, she will be going to Guinea with OIC International to assist in establishing Biointensive gardens around family homes and in communities. She teaches backyard Biointensive gardening in Palo Alto and takes time to travel while teaching sustainabili along the way.